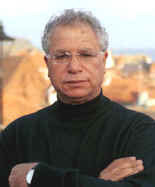 Mourid Barghouti, the Palestinian poet, was born in the mountainous village of Deir Ghassaneh near Ramallah in 1944 and later studied English literature at university in Cairo. He graduated in 1967 - only to become a refugee as a result of the war with Israel. He has spent much of his life in exile and currently lives in Cairo. In addition to his writing, he has worked as a teacher in Kuwait and Egypt, in Budapest as representative of the PLO, and in Cairo for Palestine Radio. He has published 13 books of poetry in Arabic, including a Collected Works (1997), and has read his poems in many Arab and European countries. In 2000 he received the Palestine Award for Poetry. In 1996 he was allowed to return to Palestine and the result was I Saw Ramallah, an autobiographical memoir about the ironies of homecoming, which won the Naguib Mahfouz Medal for Literature.